Astronomers received the first detailed images of the vicinity of the supermassive black hole in the center of the Milky Way, which indicated an unusual form of its emissions, not predicted by theory. The data of radio telescopes and “photographs” were published in the Astrophysical Journal. “The addition of the APEX telescope almost doubled the length of the shoulders in our virtual observatory, which allowed us to achieve a fantastic resolution that is three times the size of a black hole, so we could see the central source of radio emission in its vicinity, it was noticeably smaller than we expected to see “, Said Ru-Sen Lu from the Institute of Radio Astronomy in Bonn (Germany). Today, most astronomers believe that in the center of all galaxies there are supermassive black holes – objects massing millions and billions of Suns, continuously exciting and absorbing matter. Some of it is “chewed” by a black hole and thrown back in the form of jets – thin plasma beams, accelerated to near-light speeds. In the Milky Way and in a number of other galaxies, this black hole is in a “hibernation”, and there are no jets in it. Scientists have long been trying to understand when it “fell asleep” and how active it was in the past, and how this activity influenced the life of stars in the center of the Galaxy and on its outskirts. Lu and his colleagues try to uncover this secret with the help of the Event Horizons Telescope interferometer, which recently combined the power of the world’s most sensitive terrestrial radio observatories in Chile, Spain, California, Arizona, the Hawaiian Islands and even the Earth’s south pole. The main goal of this project, as its name implies, is to “get close” to the horizon of the events of the black hole Sgr A *, located in the center of the Milky Way, and comprehensively study its properties. Combining the power of telescopes allows scientists to achieve a resolution that exceeds the sensitivity of the “Hubble” a thousand times. Four years ago two Chilean telescopes – the APEX microwave observatory and its “big sister” ALMA – connected to this project. This allowed scientists to get the first data on the nearest neighborhood of a black hole and to study the structure of those areas where jets and associated radio emission beams are born. 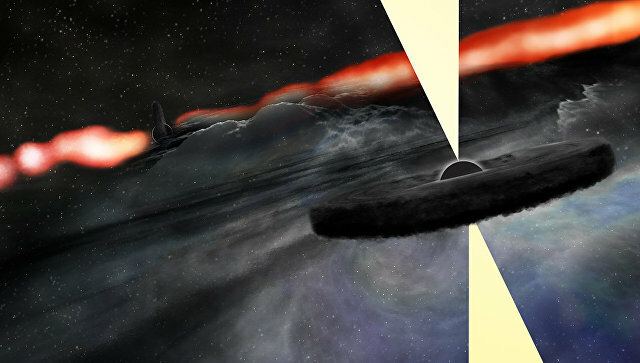 These images showed that the sources of electromagnetic waves surrounding the black hole have an asymmetric structure, which was an extremely unexpected discovery for many theorists who believed that the entire accretion disk, a bagel from “chewed” matter, was involved in the birth of jets and beams of radio emission. While the EHT permission does not allow us to say what form this active region has, but now scientists suggest that it may look like either a ring of irregular shape surrounding Sgr A *, or a kind of twisted “dumbbell” in the center of which is a black hole . Analyzing data collected with the participation of ALMA last year, as the scientists hope, will help to understand which of these two ideas is closer to the truth, and tell us whether the shape of this “bagel” or “dumbbell” is changing with time. All this will help to find the answer to the main riddle of black holes – how jets are born and what causes them to accelerate to near-light speeds.